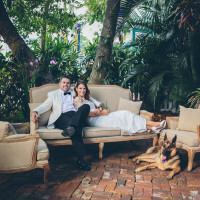 It’s safe to say after 10 years of coordinating and designing weddings that our founder and principal stylist, Peggy Russell, knows a thing or two about weddings. Yet that didn’t stop her from putting on her travel boots this year to take a mini tour of the U.S. to study with some of the wedding industry’s best. What most people don’t know initially about Peggy, but what becomes abundantly clear after only a few minutes in her presence, is that she is a lifelong learner, always seeking to expand her circle of influence and inspiration, especially in the creative realm. 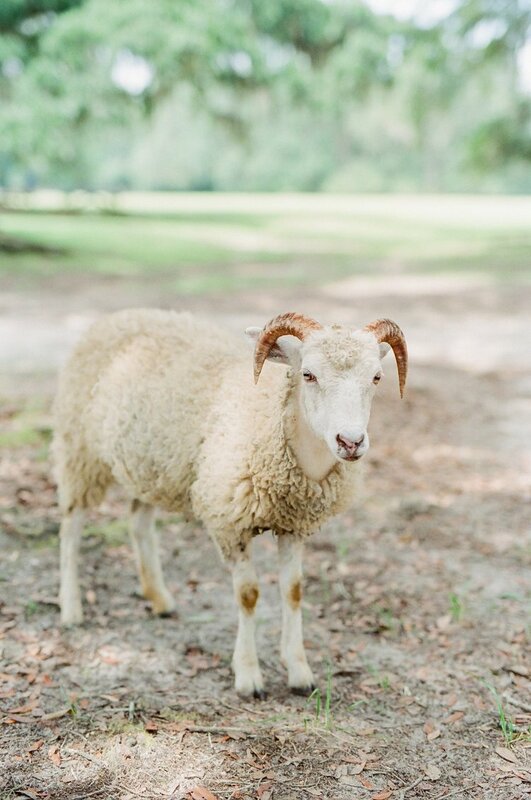 So during my last trip to Miami I took the opportunity to sit down for a Q&A with Peggy to ask her about her most recent trip to Charleston, styling, and her newest endeavor – foraging and creating bouquets. 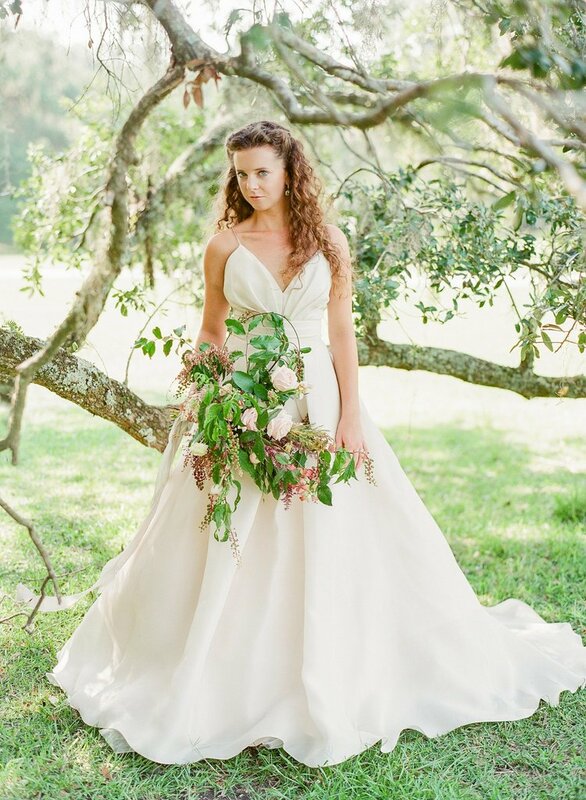 Alex: What, if any, was the inspiration behind how you styled your bride? Peggy Russell: For the most part, I am always inspired by a bride’s story and the vision they give me for their wedding day. 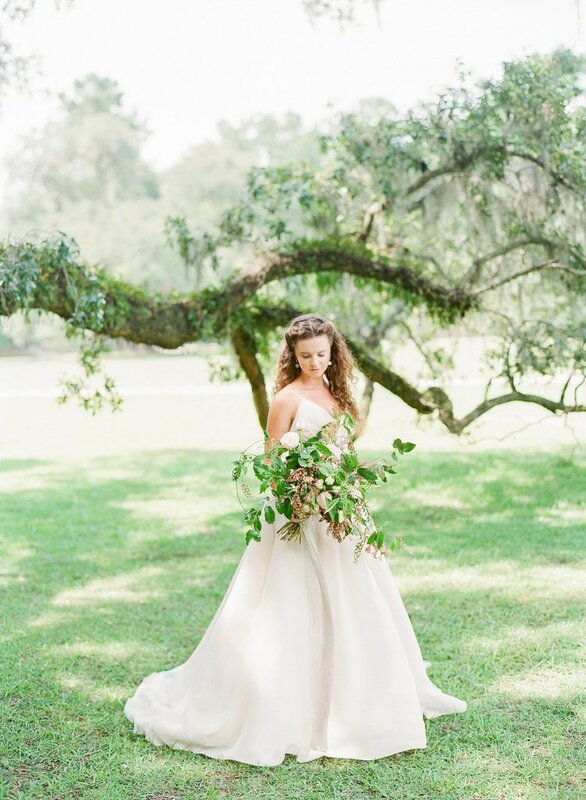 However, in this particular instance, it was impossible not to be inspired by the ethereal and timeless beauty of the location, which was a 100 year old property outside of Charleston, South Carolina, so I felt deeply inspired to honor the period of the location. I picked a dress with clean and simple lines made of raw silk that had a touch of modernity but could have been an heirloom as well. 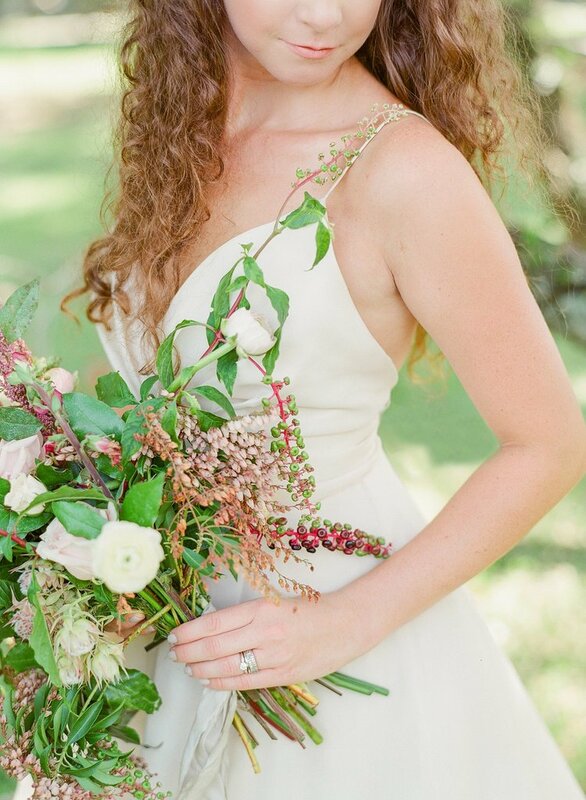 I also wanted a less busy dress because I really wanted to accent the bride’s florals, which were created by blending an array of both greens, which were foraged from the location, and florals. I loved the randomness of the bouquet. It seemed so much more like this great bundle of nature versus a more contrived bouquet. It really felt inspired by the place. I loved that aspect of it! 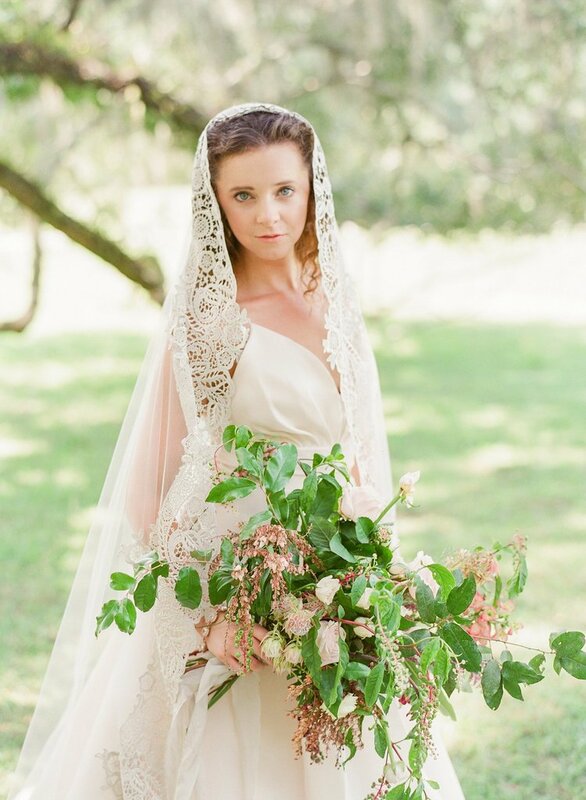 And the veil I picked because it so perfectly and delicately framed both the dress and the bride. Also, the intricacies of the lace added that last something extra that brought the whole look together. Alex: What was the creative process like of putting a wedding bouquet together? 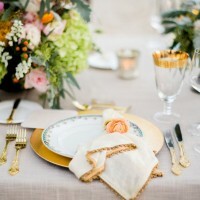 How, if in any way, is it similar or different to wedding decor design + styling? Peggy: When we do a bouquet it is almost always dependent on the dress. If the dress has lace and/or is very detailed we look to keep the bouquet simple and understated. If the dress is simple and elegant we can do two things, we can have the bouquet be a statement piece or keep it simple and refined just like the dress. 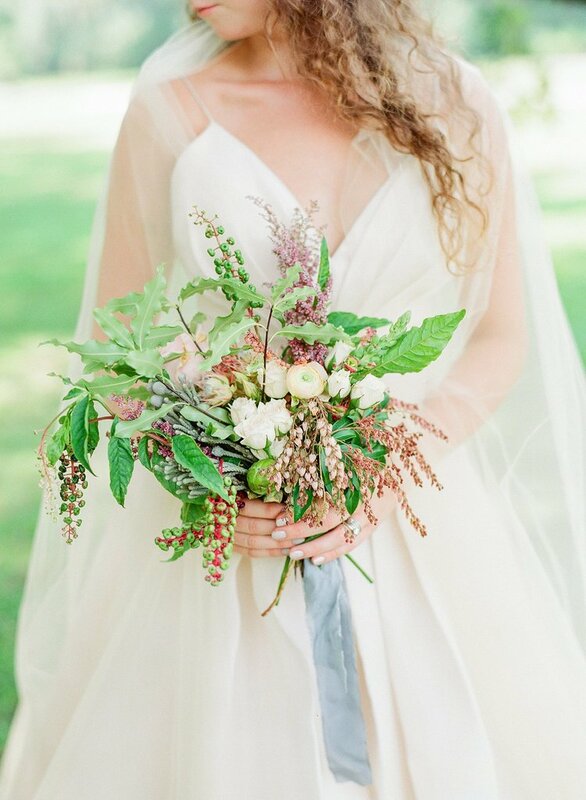 The newest trend is to capture nature and give the bouquet a much more free, less compact look. In regards to the second question, decor usually gives an overall feeling of the evening, the framework for everything else we do, where a bouquet really makes a simple statement either on its own or within the framework of the decor. In the wedding industry, trends usually move west to east, so if you look at some of the real well-known wedding stylists, they are showing us a much more natural, classic, timeless decor and I would say we are beginning to see the same with bouquets. Alex: How did it feel once your bouquet was wrapped in it’s ribbon and ready to be held? Peggy: Honestly, I really didn’t fully appreciate it until I saw it within the backdrop and next to the dress. 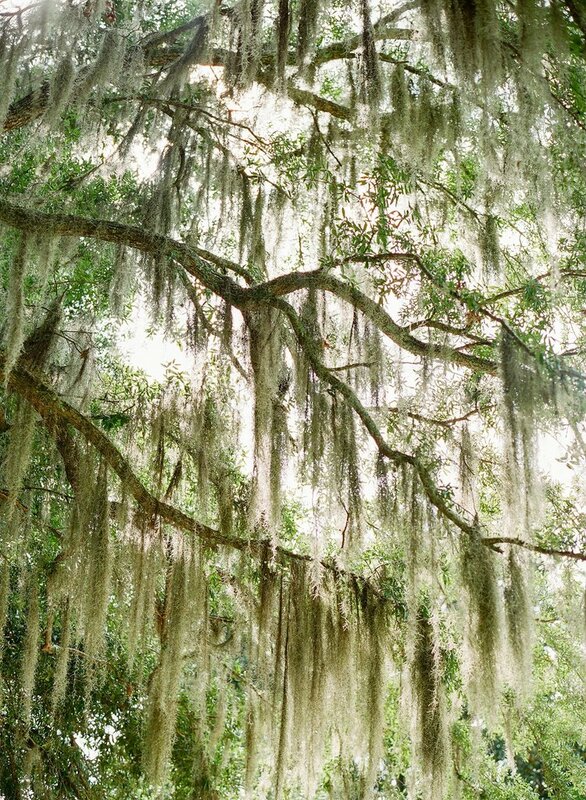 But once I saw it being held and there were these wonderfully cascading trees all around, I really felt like I had accomplished what I wanted, which was to make a statement piece yet still maintain the integrity of the surroundings. The great part was I designed 2 or 3 so there was some freedom to see how each one integrated with the dress. Did it make you feel any more connected to the bride? 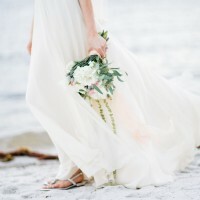 To me, the bouquet, being one of the most important accompaniments to a bride’s dress, is also one of the most personal parts of the design process because it’s really a gift to the bride, so for sure, it made me feel much more connected to the bride. 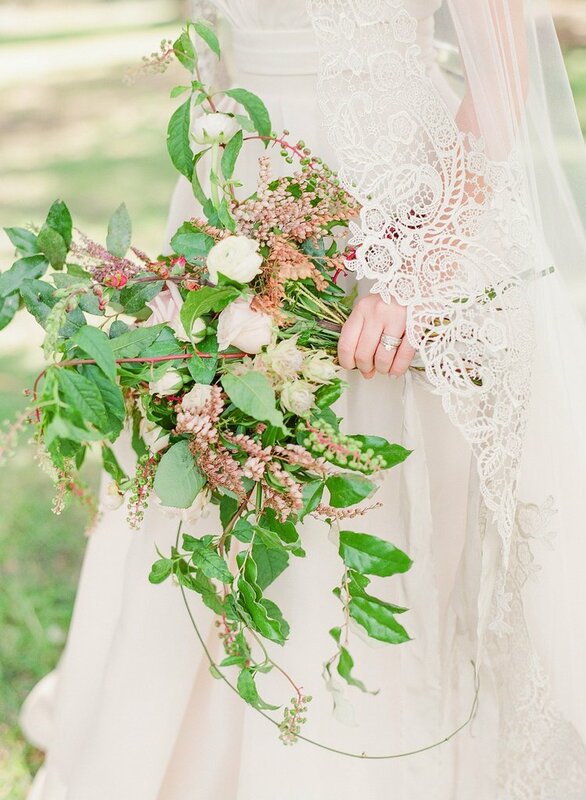 Alex: Any advice to your brides in regards to choosing the right flowers, bouquet style and/or floral design aesthetic for their wedding day? Peggy: Always try and have a picture that serves for inspiration or a piece of material or lace you can share with both the wedding and floral design teams. 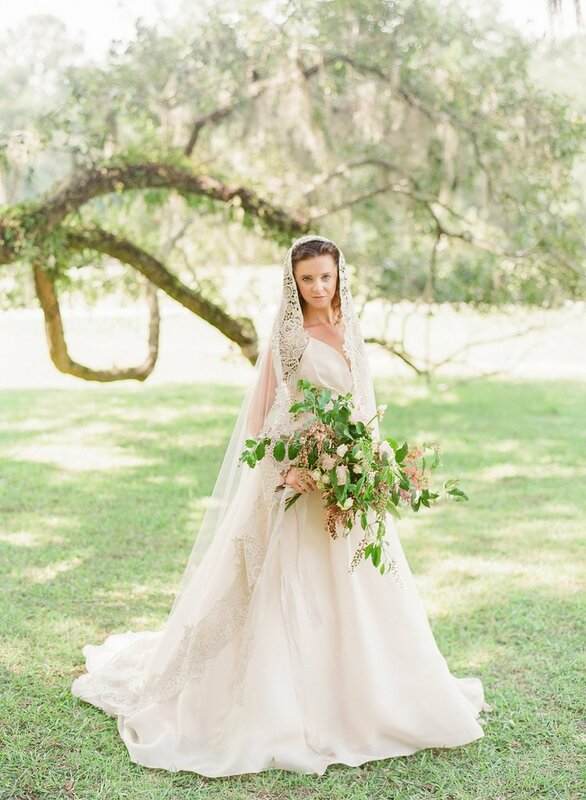 Often a single image, a piece of fabric, or the wedding dress can can help inspire the decor and flowers in ways unforeseeable and unimaginable.